Existing building is monument of 20th century Latvian modernism architecture. Absorbing and adapting modernism architecture to contemporary functional and technological requirements becomes an important topic in Latvia as well as other countries in Europe. 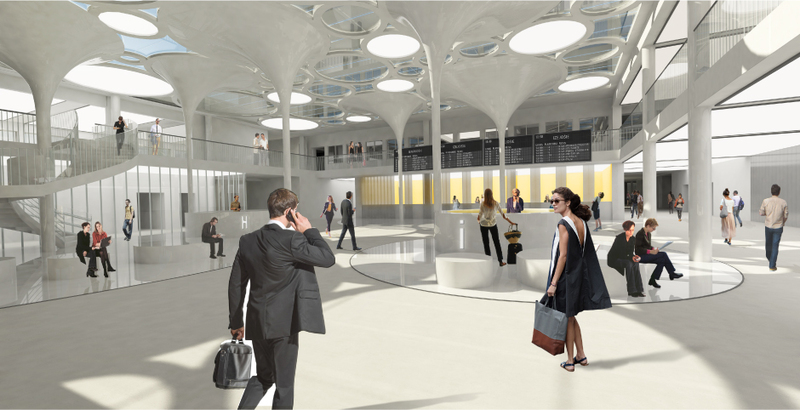 This is the focus for architectural proposal concept – regenerating the existing bus station building integrating it in a new elegant volume in order to enlarge the complex and adapt it as a contemporary social hub. This building with its new functions became a new warm “spot” for citizens of Riga. 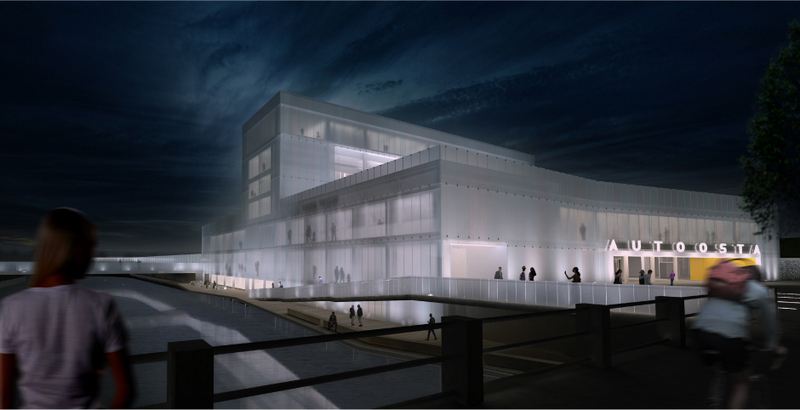 The intention is to transform a single function building in a multiple contemporary space full of different activities around two main interior public squares. The atriums are defined by a shed cristal roof supported by column that orient the space like trees and allow the light to pass trough softly creating an enchanting atmosphere. 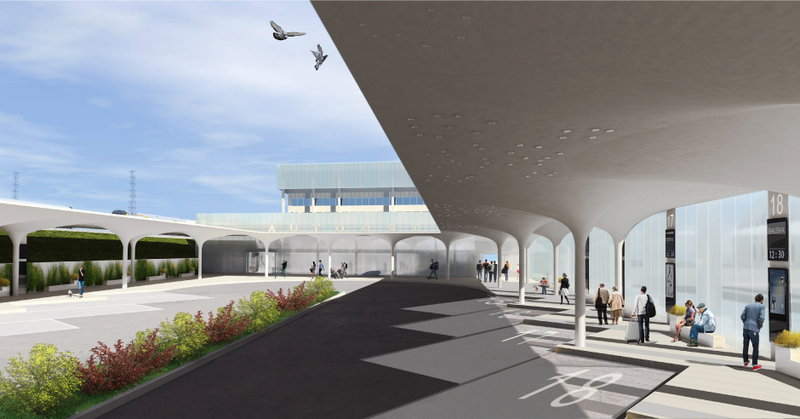 Those squares are like winter garden where people and passengers stops and are in connection with the main entrance plaza from one side and with bus station arrival and departure from the other side; moreover the interior squares help to organise the entire complex of activities. The intention is to project the exterior into the interior in a continuos unique block with a strong new identity preserving gently the old structure. The facade respects the same idea of fusing the outside with the inside using a frosted glass that reflect the surrounding and at the same time allow the transparency. 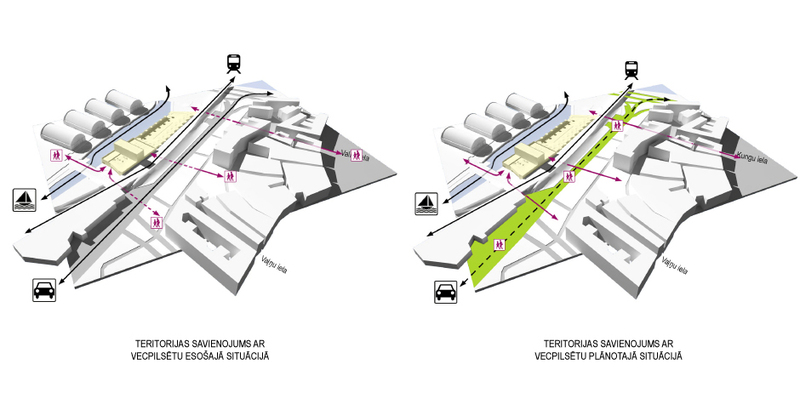 On urban scale the intervention of the new coach station is designed as a node of intersection with different mobilities infrastructures including the water system by regenerating the rivers with bridges and pedestrian pathways. The project pay strong attention to relate the complex with the city and with the principal roads of communications amplifying its character of big interchanging node including the connection with the railway station and the characteristic market pavilion buildings.